Tall, upright and of striking appearance, Mr Emson commanded the respect and highest esteem of everyone associated with the social and governing life of the town, and although many years have passed since the Great War his four years of engrossing work as Mayor during those anxious days are remembered with gratitude by many of his old colleagues. The ‘engrossing work’ Charles undertook during the war included a prominent role in supporting the Belgian refugees who came to Tunbridge Wells. Charles Whitbourn Emson, a cordwainer’s son, was born in 1855 in Bow, East London. He lived in Kennington and then Surrey, working mainly in insurance. In around 1907, when he was 52 years old, he moved to Tunbridge Wells, together with his wife Margaret and two young daughters, Marjorie and Barbara. Charles had retired from business by this time, but became involved in local affairs. In 1909 he was elected to the Tunbridge Wells District Council (he had previously been a local councillor in Surrey) and in November 1913 he was appointed as Mayor. Less than a year later he would be called on to play a key role in the town’s war effort. I am pleased to inform you that arrangements have been made to accommodate 30 Belgian Refugees, not of the peasant type, but of the middle class and tradespeople. 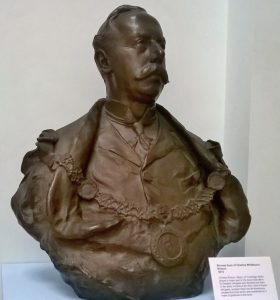 As a result of the work that followed, the local Belgian community commissioned sculptor Paul Van De Kerckhove to create a life-size bronze bust of Charles, which was presented to the town at a ceremony in the Great Hall on 22 September 1915. The Belgian professor who made the presentation spoke of Charles’s courtesy, kindness and persevering self-denial. In responding, Charles referred to the pleasant time he had had with the Belgians, despite the unfortunate circumstances which had brought them to the town. In November 1917, Charles was replaced as Mayor (after an unprecedented four years in the post). However, he continued as Chairman of the Belgian Refugees Committee for the rest of its life. When the committee met for the last time on 23 May 1919 (by which time all of the town’s refugees had returned home) a vote of thanks was made to him for his key role and the assiduous manner in which he had undertaken it. In May 1919 the Courier recorded that Charles had received the decoration of the Chevalier de L’ordre de la Couronne, bestowed on him by King Albert of Belgium, in recognition of the help he had given to Belgian refugees and soldiers. The article continued that the honour was full deserved, due to the close personal attention Charles had devoted to the welfare – economic, social and educational – of a large number of men, women and children in enforced exile from their native land. He had raised over £6,000 for their support, but it was perhaps as guide, philosopher and friend that he was so beloved by the Belgians. Charles continued to be interested in the Belgian connection; in March 1920 he arranged a series of lectures by the Anglo-Belgian Union, intended to promote a better understanding of their country’s history. Royal Tunbridge Wells Civic Society. The Shock of War: Tunbridge Wells: Life on the Home Front 1914-1919, Local History Monograph No. 13. This entry was posted in Reflections, Research notes and tagged Anglo-Belgian Union, Belgian Refugee Fund, Belgian Refugees Committee, Charles Whitbourn Emson, Chevalier de L'ordre de la Couronne, churchwarden, Folkestone, General Hospital Board, Insurance, King Albert, magistrate, Margaret Emson, Mayor Charles Emson, Mayor Emson, Paul van den Kerckhove, Tunbridge Wells District Council. Bookmark the permalink.